Enter for your chance to win Super Bowl tickets for life. Saw the new Bud Light Dilly Dilly commercial lately? 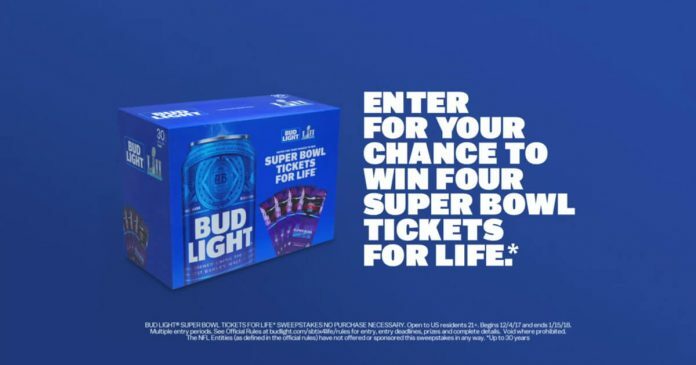 It’s now time to enter the Bud Light Super Bowl Tickets For Life Contest for your chance to win four Super Bowl tickets for life. Look inside specially-marked packages of Bud Light beer for a code and enter online at budlight.com/sbtix4life by January 22, 2018 for your chance to win. You can also enter without making a purchase by registering at budlight.com/sbtix4life/free or by texting SBTIX4LIFE to 50563. 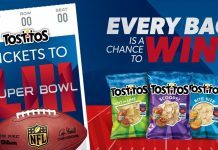 What Is The Bud Light Super Bowl Tickets For Life Contest? The Bud Light Super Bowl Tickets For Life Contest is a new Super Bowl Sweepstakes sponsored by Anheuser-Busch, LLC. The Contest is open to residents of the United States who are 21 years of age or older at the time of entry. 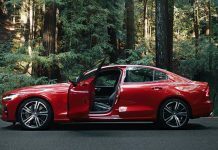 Sweepstakes begins at 12:00:00 a.m. CST on December 4, 2017 and ends at 11:59:59 p.m. CST on January 22, 2018. 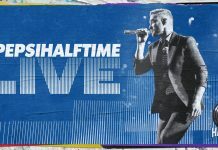 Once you have obtained a Code, visit budlight.com/sbtix4life during the Sweepstakes Period and follow the online instructions to enter your Code and complete and submit the entry form. For complete details and official rules, visit budlight.com/sbtix4life.